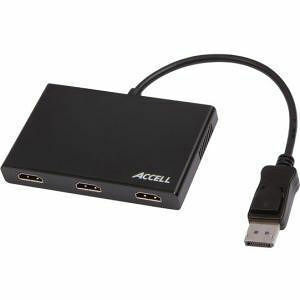 The Accell UltraAV DisplayPort 1.2 to 3 HDMI Multi-Display MST Hub allows you to enjoy up to three independent HDMI monitors from a single DisplayPort output while utilizing the new multi-stream transport (MST) protocol. The MST Hub can support up to three high-resolution displays independently, two monitors with resolutions up to 1920x1080 @60Hz and the third monitor up to 2560x1600 @60Hz*. With the UltraAV MST Hub you can chose to expand a single image across three displays, perfect for high resolution gaming. For the efficiency and productivity of multi-tasking, easily dedicate each display to a separate application. *The maximum resolution is dependent on the throughput of DP 1.2 or HDMI 1.4 as well as the graphics and display solution used. For a digital signage or video wall application, use two MST Hubs with a video card that supports multiple DisplayPort outputs. This setup will provide enough video ports to support up to 6 monitors independently. The use of multiple MST Hubs requires a computer and a graphics system with enough display pipes to support the multi-display array.